The line-ups have been confirmed for the Division Cup finals in the Bridlington and District Evening League. Bewholme will play Burton Agnes in the Division One final on Friday, July 8, with the Division Two match being played one week earlier, between Driffield Academy and Middleton. Trinity SCC take on North Frodingham in the Division Three final on Monday, June 27. Last week, saw the final set of matches in the roundrobin stage of the cup. Burton Agnes secured their place in the final by beating Sewerby, thanks mainly to the batting of Luke Ramsey. His 80 not out helped Agnes to 147 in 16 overs before Sewerby were all out for 88. Bewholme will provide the opposition in the final after they beat Grindale by six wickets. Russ Robinson top scored with 38 in the hosts’ total of 106/4, with Nick Hardgrave picking up 2-17. 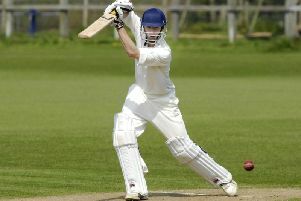 Richard Riley fell one short of his half-century in Bewholme’s successful reply. Driffield beat North Dalton, reaching their target with two-and-a-half overs to spare. Shaun Tate made 36 and George Drury 23 as Dalton posted 103-5, Kevin Walker talking three of the wickets and Nick Johnson the other two. The runs were shared out as Driffield got home with five wickets in hand, Owen Goldsworthy’s 20 the highest score. Driffield Academy’s game at Wold Newton was abandoned but they had already done enough to make the final. Middleton had also amassed enough points to ensure their defeat to Driffield RUFC was irrelevant. Richard Brigham and Bower both got into the 40s as Middleton set 116/3, but the rugby club overhauled the target. Clarke made an unbeaten century and Falkinham added 28 in a five-wicket win. Flmaborough enjoyed the biggest win of the night, and Simon Leeson made the highest individual score, as they crushed Rudston and Kilham. Leeson’s 92 not out was supported by Harry Gunning’s unbeaten 42 in a total of 155/1. Rudston batted through their 18 overs, but only made 50-4, as Gunning added 2-7 to his evening’s work. Barmston crumbled to 30 all out in their Division Three defeat at home to Trinity SCC. Earlier, Trinity had made 142/5, based around Jack Ibbotson’s 76 and Ward’s 51. Adam Wooley’s innings of 69 proved crucial as Hutton Cranswick won at Globe. He contributed almost half of his team’s 140/7, but the Bridlington side went close in response. North Frodingham held on to beat Wetwang by 14 runs. The hosts batted first and George Crabtree hit an unbeaten 35 and Andy Inns added 21 as they Frod just about made it into three figures. Lawson made an unbeaten 40 for Wetwang but two wickets each for Alex Muirhead and Mark Londesbrough helped to peg back the reply, and Wetwang ran out of overs at 89/4. In the first round of the Hospital Cup, Jordan Caley smashed 78 not out to help Driffield Academy to progress at the expense of Flamborough. The Academy’s 136-1, which also saw 38 from Robbie Milner, proved too big an ask for Flamborough. They could only manage 105-3 in reply, despite 36 from Luke Dixon and 26 from Marcos Garcia.